If you’re looking for privacy and pampering at crowded resort pools this summer, reserving a cabana is the way to go. Cabanas and Pool Parties seem to be some kind of Scottsdale rite of passage. And if what you’re looking for is a place to sip a mimosa in your swimsuit while peering over your sunglasses at a panoramic view of Scottsdale, you’re in luck. Here are a list of pools you can “Beat the Heat” and take a nice, long dip in the pools of these hot staycation spots in the Valley. Available daily from 11 am to 5 pm at Princess Pool & Bar, Sunset Beach and Sonoran Splash. Cabanas include a flat screen TV, bottled water, fruit plate and more. Pricing and availability vary. To reserve a cabana at Princess Pool & Bar, Sunset Beach or Sonoran Splash, please contact reservations at 480-585-2694. Well & Being Rooftop cabanas are available each Friday and Saturday. Pricing and availability may vary. Spend all day enjoying two 200-foot twisting water slides* or sneak off to enjoy a luxurious private cabana. For tots, there is a zero-entry deck area as well as a large sandbox complete with Tonka trucks and beach toys, sure to keep little ones entertained for hours. *Children must be a minimum of 42″ tall to ride the slides. Opened Memorial Day Weekend, the Princess’ sixth and largest pool, 9,000 sq. ft. white sand beach, 102 brand new luxurious guest rooms and giant Splash Pad are ready to provide family fun all summer long. Settle into the “see and be seen” atmosphere of the main Princess Pool, a grown-up’s haven. Enjoy poolside Quench services from Well & Being Spa, kick your feet up and rejuvenate with a cocktail or take soak in the oversized hot tub. An a la carte menu is available for additional food and beverage items and cabanas are available for rental. Spend the entire day At the Omni! With our Roomy Cabana package there’s no reason to leave. For $125 utilize one of our spacious guest rooms for the day while basking poolside at one of our luxurious cabanas. 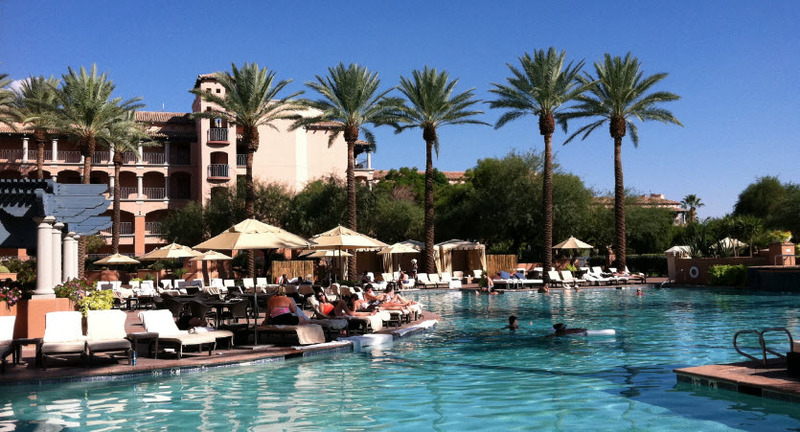 It’s the perfect excuse for a relaxing day of fun for you and up to five guests at one of Scottsdale’s premier resorts. With access to full amenities including an oversized bathroom and plush bed, you can take a break from the sun with a cozy nap or an afternoon of Netflix movies and room service before returning to the pool. And if it’s all too nice, upgrade to have the room overnight for an additional $75. Book a spa service and receive the same roomy cabana offer starting at $75. Spa service, cabana rental and day-room rental must be booked on same day. Day use of a poolside cabana for up to 6 people from 10:00 a.m. – 6:00 p.m.
A maximum of six guests permitted per cabana. Smoking, outside food, beverage, music, and glass are not permitted within the pool or cabana areas. Loud, offensive and/or profane language are prohibited. Offer not available on holiday weekends. 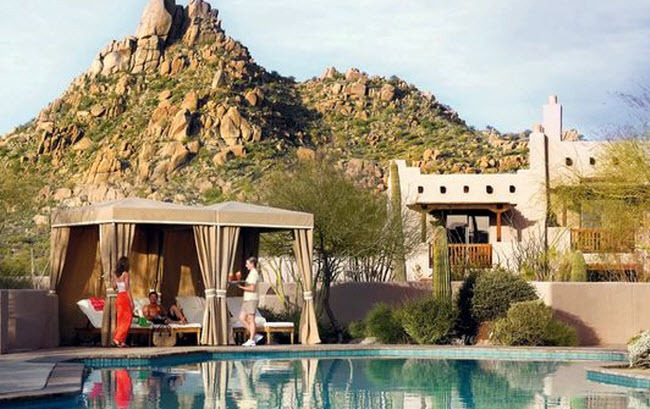 Poolside cabanas are the perfect way to relax in the Arizona desert. Rentals are available at both Kasbah and Oasis pools. A maximum of six guests permitted per cabana. Smoking, outside food, beverage, music, and glass are not permitted within the pool or cabana areas. Loud, offensive and/or profane language are prohibited. Call (888) 627-3010 for reservations and pricing. Sparkling throughout the day with an evening glow, the Kasbah Pool lies in the very heart of paradise at Omni Scottsdale Resort & Spa at Montelucia. 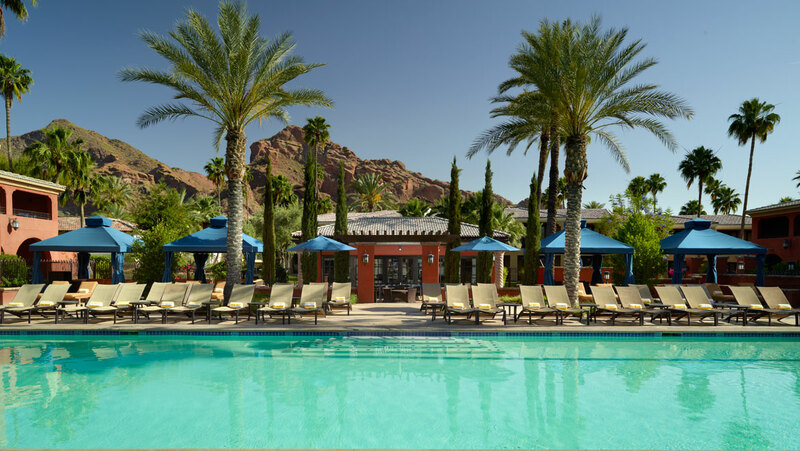 Relax poolside and take advantage of spacious seating areas, cabanas, a lounge area, a restaurant and bar, and magnificent views of Camelback Mountain. Lofty architectural details are reminiscent of a Mediterranean seaside resort, surrounded by sensual fire features and pulsating energy. 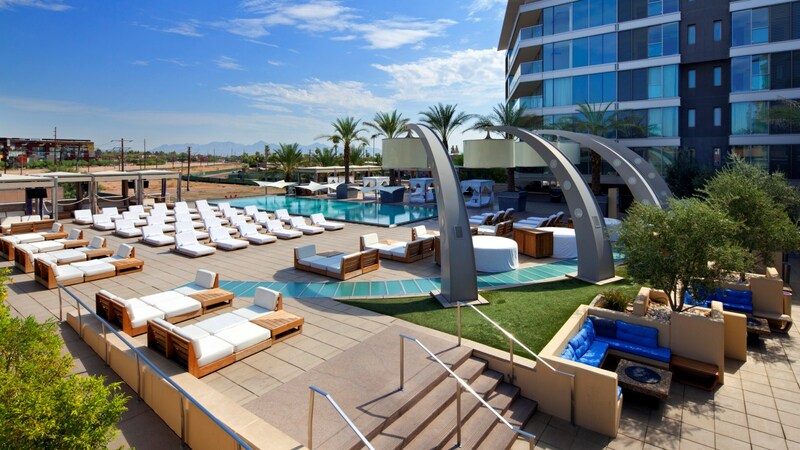 Sip on a chilled, fresh cocktail at the hottest poolside bar in Scottsdale. Let an oversized spa melt away all the tension and worries of everyday life. 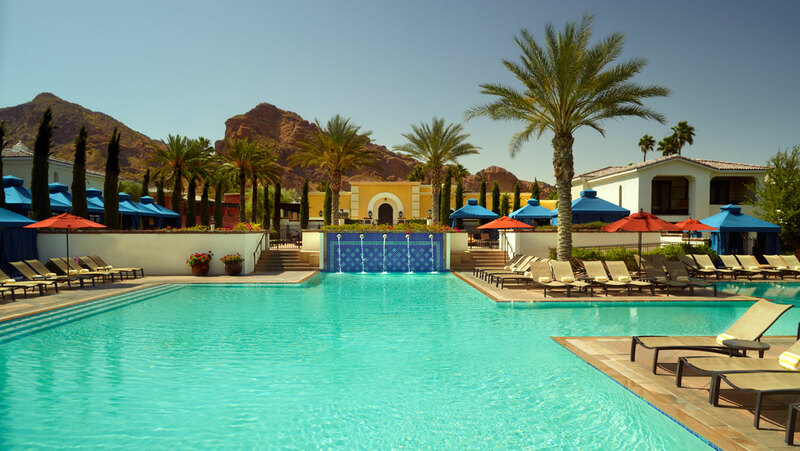 Hidden among soaring palms and our lush resort grounds, the Oasis Pool is a peaceful poolside experience for adults inspired by the Old World and features direct views of Scottsdale’s most famous landmark, Camelback Mountain. Retreat from the shade in one of our available cabanas and refresh in the sun-kissed pool and soothing spa. Grab a chilled cocktail from the Pavilion and relax under the beaming desert sun. Release your cares away at the Oasis Pool. Find an outdoor oasis of relaxation with picturesque mountain and desert views. Surrounded by foliage and chaise lounges, the waters of our free-form bi-level pool are heated for year-round enjoyment. Settle poolside on a landscaped deck, with shade offered from cabanas and trellises while misters help you keep cool from the mid-day sun. At one end of the main pool is a children’s pool, giving kids a place of their own to splash around; at the other end, an adult whirlpool offers a relaxing place to enjoy a soothing soak. Private bar stocked with selection of waters, soft drinks and iced teas. TO RESERVE A LUXURY CABANA, PLEASE CONTACT OUR RESERVATIONS TEAM AT +1 (888) 207-9696. 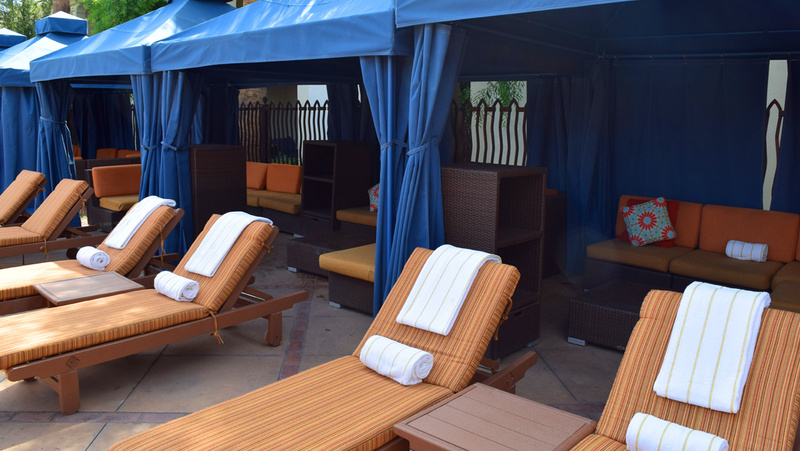 Standard poolside cabanas are available on a complimentary, first come, first serve basis. Guests also have the option of reserving one of a select number of our upgraded poolside cabanas for the day. If it’s fun, friends and entertainment you want poolside, this is the place. A live DJ, poolside cocktail and food specials and private cabanas for eight or 16 make this pool a party all summer long. Day or night, W Scottsdale’s WET pool deck is open 24/7 for your dipping pleasure! Join us for a swim, or hang out at our iconic rooftop WET pool, where we offer a fun sunbathing atmosphere! During the weekends, our DJ spins the hottest beats from 12PM to 6PM then returns from 9PM to 2AM making this the ultimate pool party in Scottsdale. WET pool is located on the second floor of W Scottsdale, perched dramatically above the hotel entrance with four large portholes on the bottom, allowing sneaky, cheeky peek-a-boos from below. 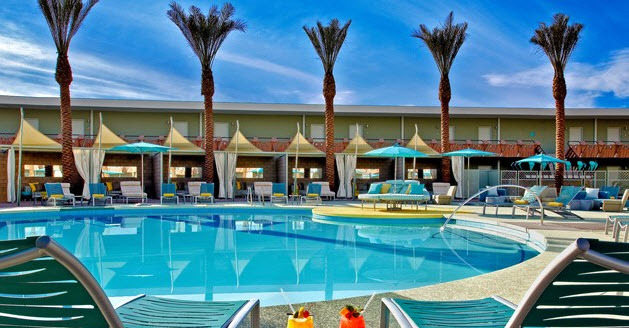 WET is one of the best pools in Scottsdale, featuring underwater lighting and music, and water heated or cooled as necessary. You’ll never want to come out of the water or leave the stylish pool scene! A seasonal, open-air destination, Sunset Lawn is situated amongst cabanas, daybeds and lounging pods. Want some exclusive fun in the sun? Reserve one of our 13 private cabanas, complete with flat panel TV, individually controlled sound, personal services and High Speed Internet Access. Feeling a snack attack? Keep lounging on that deckchair; we’ll bring you food and beverages from the Sunset Lawn poolside bar so you don’t have to lift a toe. Note: W Scottsdale has a limited amount of lounge chairs available. Lounge chairs are available on a first come first serve basis and for hotel guests only. All cabana rentals come with 10 wristbands for entry, a bucket of bottled waters and a fresh fruit plate. Daybed rentals come with 6 wristbands for entry. For cabana and daybed pricing please call 480-970-2101. This is so FANTISTIC…I now know what to do for the next 5 weeks, Thanks Todd for the great info!!!!!!!!!! !